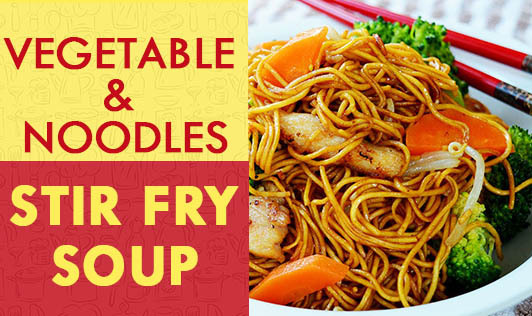 Try this delicately-flavored and colorful, low-calorie vegetable and noodle stir fry soup. Blanched & Diced Baby Corn- 5 to 6 nos. 1. Heat a wok on high flame. 2. Add 1 tablespoon of oil and add all the vegetables and stir-fry on a high flame for 3 to 4 minutes. 3. Add the boiled noodles and stir fry for 2 minutes. 4. Now add the corn flour paste and ½ cup of water and cook for a few minutes. 5. Add a little more water, if the mixture turns a little thick. 6. Finally add the sugar, chili sauce, soya sauce, and salt, and cook for a few more minutes. Note: You can make it protein-rich by adding chicken, egg, or soya chunks to it.